Normally I like big, fat, thick pork chops. Ones that are almost more of a roast, than a chop. To me those are just as enjoyable as a nice steak. I like to refer to these thin chops as "weeknight chops" because they are ideal on those nights when you are in a hurry and don't have time for a 4 hour brine and a two stage roast/sear type cook. Just a quick marinade and slap these guys on a hot grill. Here is a version that we did tonight. The flavor of agave nectar is kind of like honey but I like it better. It has a hint of molasses or something smoky - perfect for grilling. So these are similar to a honey-mustard grilled chop, only better. Whisk together the vinegar, agave nectar, mustard, oregano, and black pepper. Whisking vigorously, slowing pour in the olive oil. Taste for seasoning and add pinch or two of salt as needed. Pour marinade over the chops and massage in to coat well. Allow to marinade for 30-45 minutes. You can let it marinade longer than that but it isn't necessary. Preheat a charcoal grill to 500f. 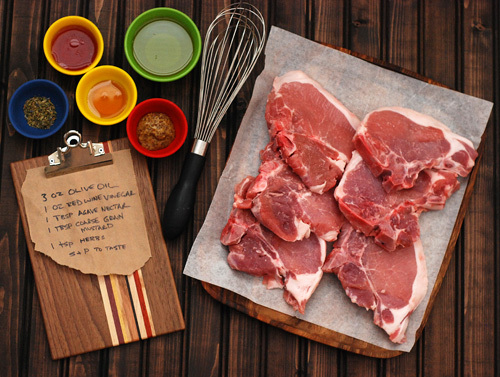 Remove chops from the marinade and grill 2-3 minutes per side until the chops hit an internal temperature of 145f. Allow the meat to rest for 5 minutes and then top with any accumulated juices. These chops have all kind of irregular shapes but the one thing they have in common is that they are thin and quick cooking. 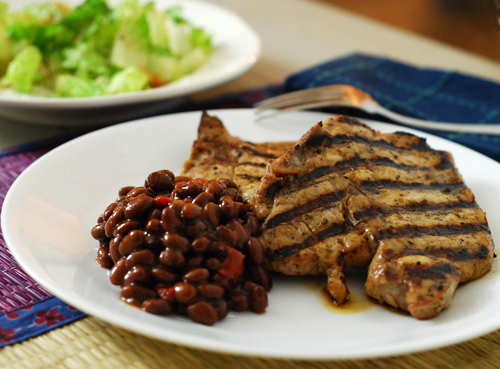 To go with our quick weeknight meal, we served these with Bush Grillin' Beans Sweet Mesquite flavor. 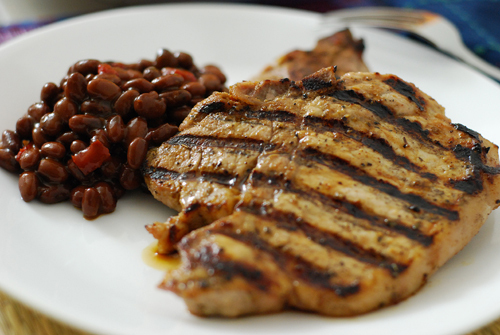 Normally, I like to pair sweet with heat but these black beans, onions and roasted red pepper simmered together was a great match for these sweet grilled chops. The salad was just chopped romaine, green onion, Parmesan cheese and a mixed berry vinaigrette that I made. Since these chops are so thin, I like to plan on one and a half chops per person just to make sure we have enough. If you don't eat them all, don't worry. They make for great eating in the middle of the night when you are raiding your fridge. [Standard Disclaimer] I have a business relationship with Bush Beans but received no compensation for this post.